If you’ve been fantasizing about lounging on a beach under a palm tree with a cold coconut in your hand, or swimming under a waterfall in the middle of the jungle, or diving with manta rays in crystal clear water, then Bali should be on your bucket list! 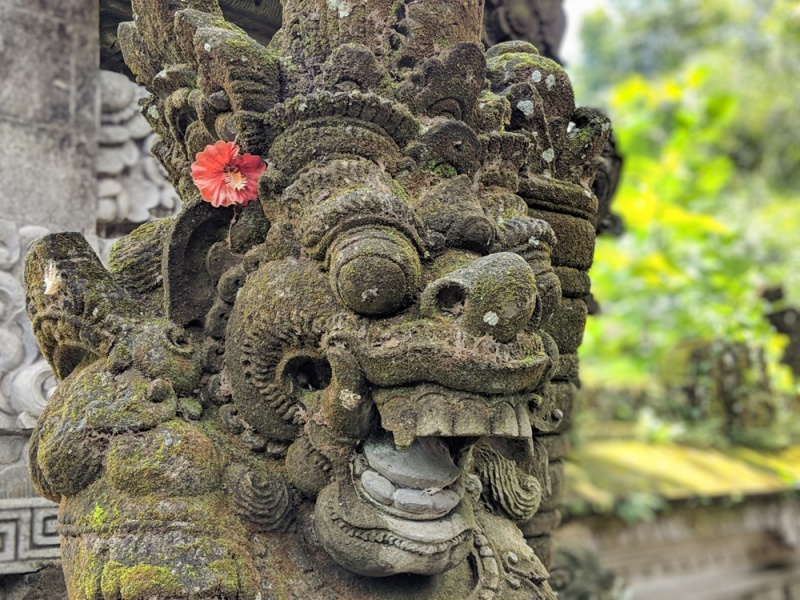 Bali is the perfect vacation destination for anyone who wants to experience another culture, but with all of the comforts of home. Here you’ll find lavish resorts, fancy restaurants offering Western-style cuisine, yoga classes, boat parties, and so much more. You won’t even really feel like you’ve left your home country! And while Bali is an amazing tourist destination, it doesn’t come without some challenges as well. Read on to learn about the things you should know before boarding that flight! Whoever is responsible for designing the street grid in Bali should probably find a new day job. Streets are too narrow, often ending in a dead end with no warning, and just don’t make any logical sense. If you are on a motorbike you’ll have less of a problem as you can weave through the endless backed up traffic. But if you need to take a car to the airport or go a long distance, be prepared for the trip to take longer than you think. If Google Maps tells you it will take 45 minutes to get to where you’re going, plan on an hour and 15 minutes. When you go to depart Bali to head home, be sure to leave a significant time buffer or you’ll risk missing your flight. 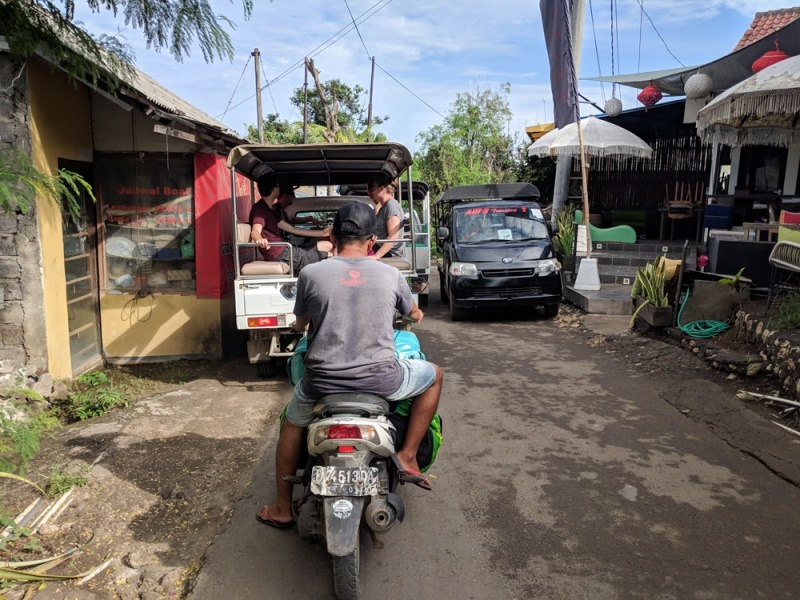 Most people who live on the island of Bali, or visit Bali choose to rent a motorbike to get where they need to go. Very few people choose to walk. And most streets lack sidewalks. If you want to walk anywhere, even short distances, it’s a balancing act of attempting to get off the road enough for cars to pass without tromping through the mud. 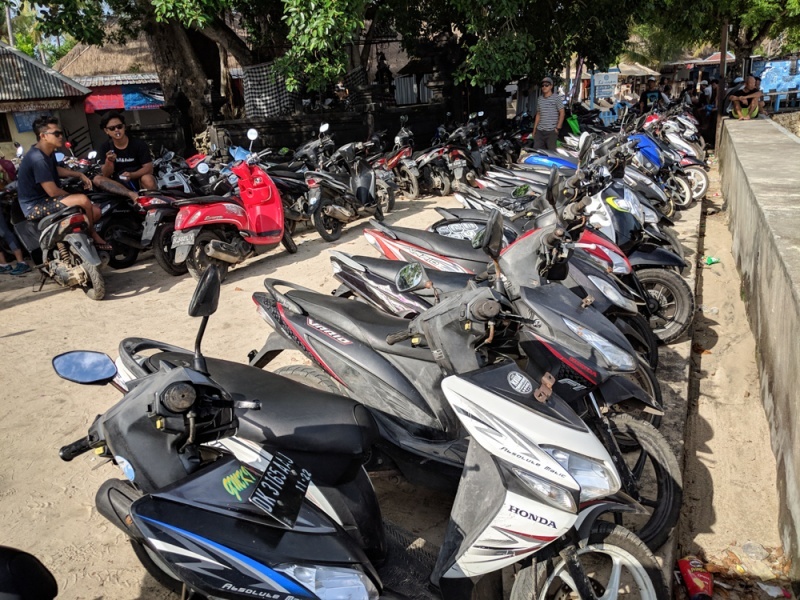 It’s relatively cheap to rent a motorbike on Bali, generally around 70,000 IDR/day (~$5 USD) and having one will likely make you feel more inclined to venture further from your hotel. If you do end up renting a motorbike, just remember that everyone drives on the left here. Be sure to wear a helmet and stay on the lookout for cows, chickens, and dogs crossing the street. Taking a taxi anywhere in the world is a huge hassle. They are pushy, aggressive, and never want to put you on the meter. They quote a price that is exorbitantly high and force you to negotiate when you actually have no idea what the ride should really cost. And then came Uber. The Uber of SE Asia is called Grab and they work the same way. You download the app, set your pickup and drop off points, get a quote, and request a driver. And you don’t have to try to communicate your destination to someone when you don’t speak their language. It’s great to use in cities all over SE Asia. Except for Bali, Indonesia. Bali has a “taxi mafia” that is working hard to keep Grab off the island. 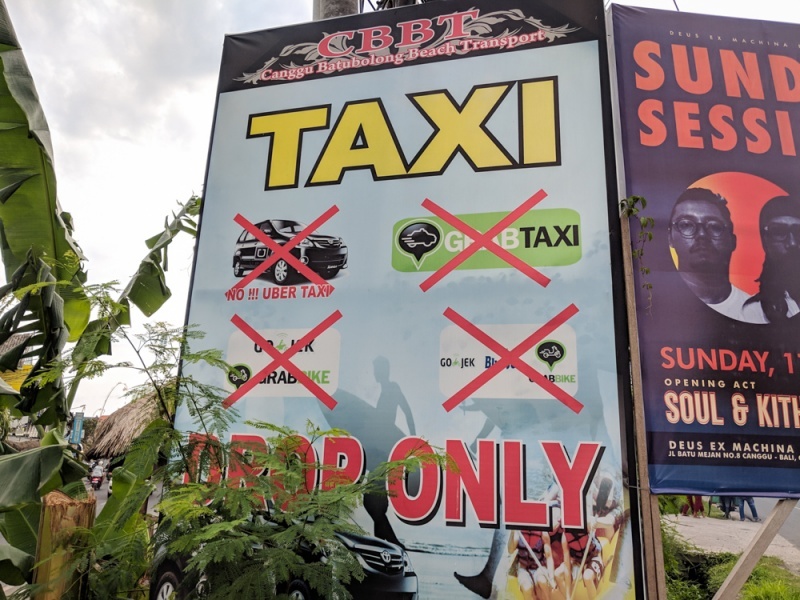 You’ll see signs all over Bali saying “no Grab allowed!” And if they do spot one of the few brave Grab drivers, they threaten and intimidate them. They’ve even smashed the windows of the cars of suspected Grab drivers. It’s really sad since Grab truly is the easiest way for foreigners to get around. If you do attempt to call a Grab, don’t be surprised if the driver asks you to meet them in another location or if they need to just cancel the ride altogether. They know where they can go and where they can’t. If you put in your location and your destination but don’t actually call a driver, you can get a price quote so you know what the ride should cost when you have to negotiate with those irritating taxi guys. Remember when people used to visit sites just to enjoy them? Before selfie sticks and Instagram and Snapchat filters? Those were the good old days. Bali is an Instagrammers heaven. Here you’ll find swings that overlook beautiful rice terraces, picturesque smoothie bowls that say “Love Bali” in strawberry slices, and colorful murals lining the streets. It seems that no one is really enjoying the food that they are eating or the activity that they are involved in, they are just attempting to get the perfectly curated photo. 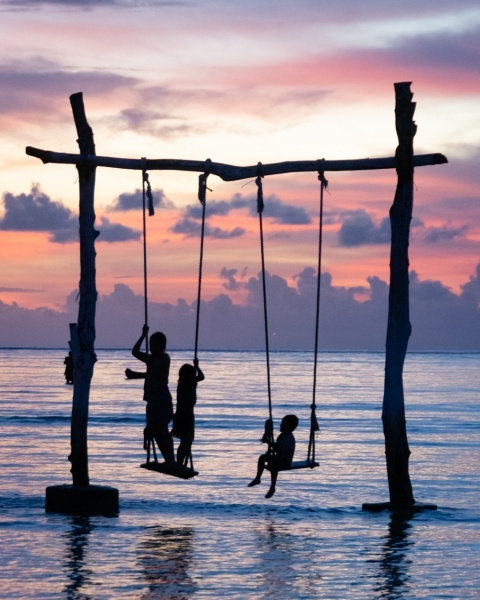 There are swing sets that sit in the ocean on Gili Trawangan (not Bali, I know, but it’s a good example of my point) and you’ll see queues of women waiting their turn around sunset. They aren’t waiting to actually swing on the swing. No, they are waiting to strike a pose while their Instagram husband/boyfriend/stranger patiently snaps away. If you do choose to partake in an activity that has been deemed “Insta-worthy”, don’t be surprised if you are requested to hurry up or to move out of someone else’s shot. While Indonesian is the primary language that is spoken in Indonesia, Bali actually has its own language that is used on the island. The languages are similar in some ways, for instance, “thank you” is “terima kasih” (pronounced ter–i-ma–kas-i) in both languages. Many other words differ. 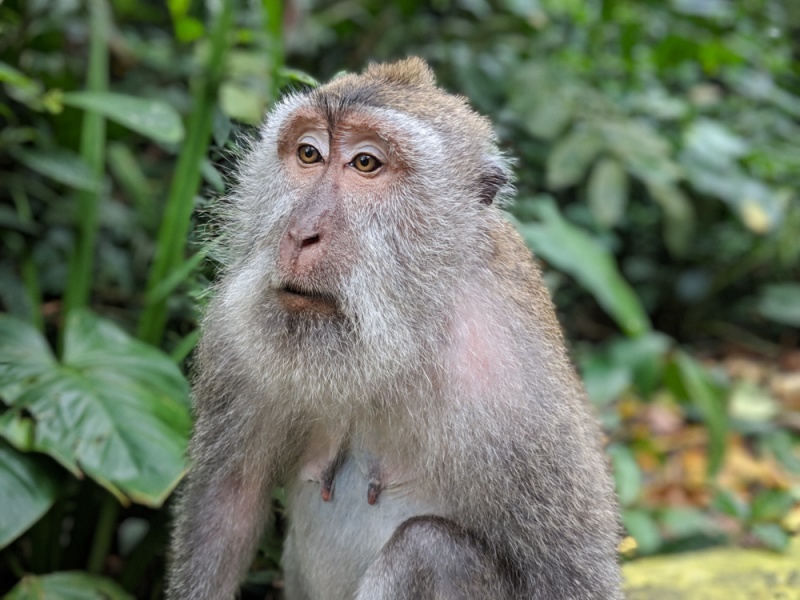 So if you learn a few helpful phrases on Bali and then try to use them on Lombok, they may look at you like you’re crazy. Want to know a few fun words to use around Bali? “Sama sama” means “you’re welcome”. “Bagus” means “good”. “Cantik” means “beautiful”. And we are pretty sure that “mybangkis” means “sneeze” but even if it doesn’t, it’s a really entertaining word to say regardless. Don’t want to learn a new language before your trip? No worries, pretty much everyone speaks at least a little English in Bali. First of all, you should know that the exchange rate is (currently) approximately 14,000 Indonesian Rupiah (IDR) to $1 USD. And their largest bill is a 100,000 (~$7 USD). So prepare to have a fat wallet full of cash. And while there are plenty of ATMs around Bali (the same cannot be said of Nusa Penida), they don’t always work with foreign cards. We had countless trips to ATMs that resulted in a “transaction pending” message and no cash. We had the best luck with the CIMB ATMs. Also, most of the stores and restaurants in the tourist areas of Bali will take a credit card. Just know that they usually add 2-3% on top for the fees that they incur. As I mentioned, the exchange rate in Indonesia is about 14,000 Indonesian Rupiah (IDR) to $1 USD. So 140,000 IDR is just about $10 USD. Doing the math quickly in your head can be challenging. It’s also a bit off-putting when you first land on Bali and have to withdraw 3,000,000 IDR from the ATM. We recently had a friend visit and she stopped at the ATM on her way out of the airport. She was a bit confused and ended up withdrawing 100,000 IDR (~$7 USD). That won’t even cover your Grab ride from the airport. And if you’re paying high ATM fees, it’s a waste of a transaction. 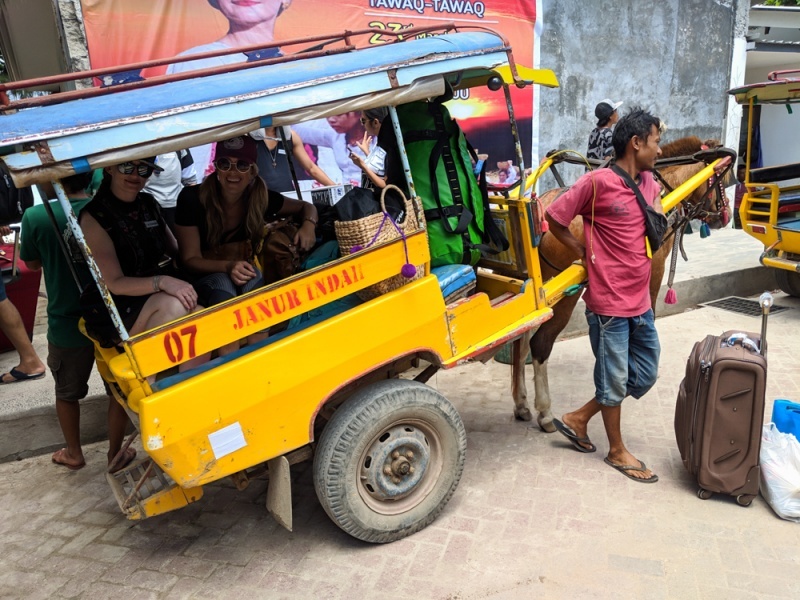 On our first trip to Bali, we accidentally paid our taxi driver the equivalent of $70 instead of $7 and had to spend our first afternoon tracking him down. You don’t want to make that mistake! “Plus plus” is the term that refers to the additional tax and service charge that many restaurants add to your bill at the end of your meal. It can range anywhere from 15-21%. If you are attempting to stick to a specific budget, that extra charge can be rather surprising. Most restaurants state the specific tax and service charge in tiny print at the bottom of their menu. And some restaurants specifically advertise “no plus plus” like our favorite happy hour spot in the Seminyak neighborhood, Ling Lings. 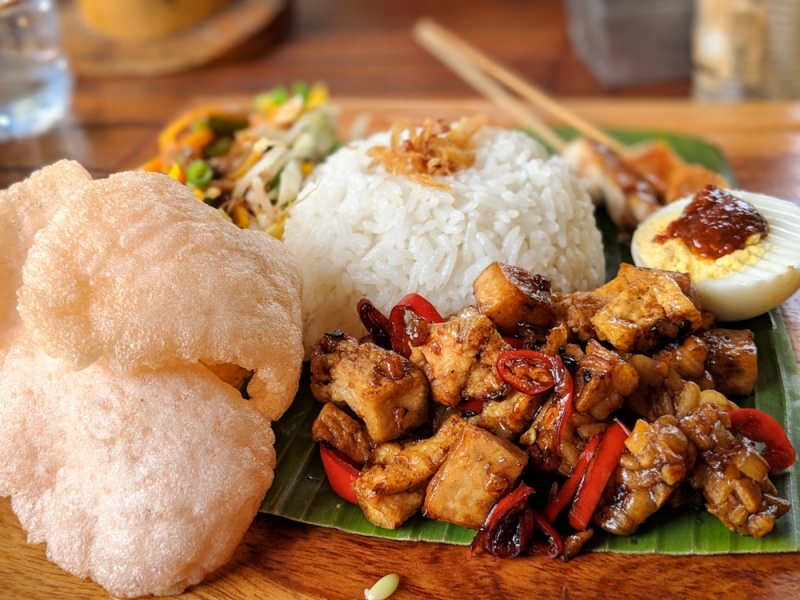 Tipping isn’t the norm in Indonesia, and especially if the restaurant has already added “plus plus”. No need to leave anything additional on top of that. Most countries in SE Asia operate on a “price is negotiable” form of capitalism. If you buy a souvenir in the market or at a little local shop, the first price that you are offered is never the real price. Of course they’d be ecstatic if you actually paid that, but most people know not to. Tourism in Bali is booming so the initial asking prices actually seem a bit more inflated than in other nearby countries. 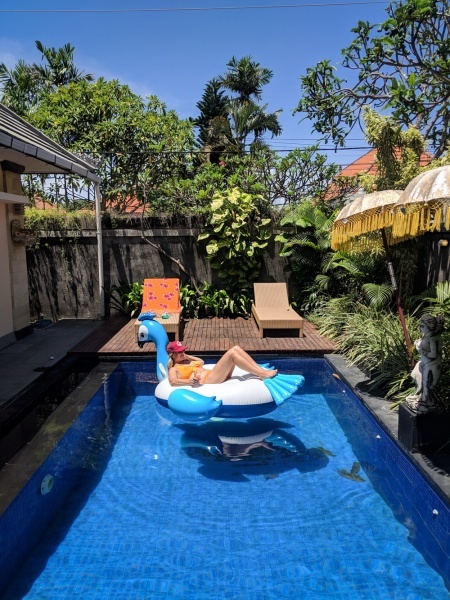 Whereas you generally end up paying about 75% of the asking price, in Bali, you should shoot for 25-50% of the asking price. Very few things are “fixed price” here, even if they say that they are. And there are things here that you’d never expect to be able to negotiate, like ferry boat tickets to neighboring islands. The best way to see if a price is negotiable is to show interest in something, ask the price, and then walk away. If they start hollering “discount!” after you, let the bargaining begin! Did you know that Indonesia has the world’s largest Muslim population? In the 2010 census, 87.18% of Indonesians identified themselves at Muslim. If you’ve ever visited a Muslim country before, you know that they are very conservative. Women cover their shoulders and knees, and often their heads. And visitors are expected to show respect by also dressing modestly. Alcohol is often difficult to get and drinking in public (especially by women) is taboo. But the religion in Bali is actually predominantly Hindu. Maybe that’s why it’s such a popular tourist destination. Alcohol flows like water, you can wear whatever you want with no judgment, and you won’t be awakened at 5:00am every day by calls to prayer. Did we miss anything? Comment below so we can add it to the list! Looking for more inspiration for your vacation in Bali? Check out our favorite travel guides! Previous Post Famous Nusa Penida Instagram Tree House: How to Book your Stay!